The Series 48W pressure sensor isolates and protects instrumentation. 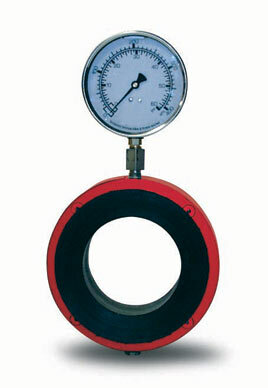 The full-port design eliminates clogging, ensuring accurate pressure measurement under the most difficult conditions. The elastomer sleeve senses pressure 360 degrees around the inner cirumference of the unit, overcoming problems like plugging and fouling of traditional diaphragm seals. Combinations of elastomers and sensing fluids provide an operating range of -208 degrees F to +400 degrees F. Standard units are rated at 300 psi operating pressure and 450 psi surge pressure. All areas exposed to the process media are elastomer covered. Depending on the type of media being handled, elastomers can be specified to offer the best combination of chemical and abrasion resistance characteristics. The elastomer sleeve extends to the full face of the flange, eliminating the need for additional gaskets.